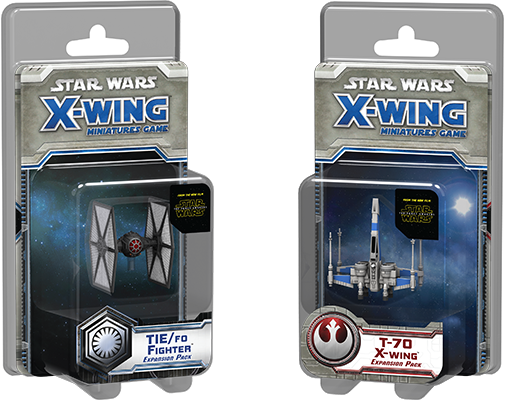 Two new X-Wing™ expansion packs are now available! 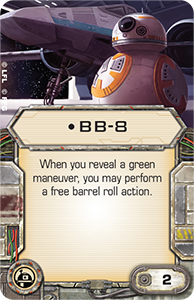 The T-70 X-wing Expansion Pack and the TIE/fo Fighter Expansion Pack have dropped out of hyperspace ahead of the rest of Wave VIII and are now available at retailers throughout the United States. Availability in other regions may vary. Featuring the starfighters that debuted in The Force Awakens™ Core Set, these expansion packs allow you to fly more missions, down more enemy fighters, and make a bigger mark on the game. 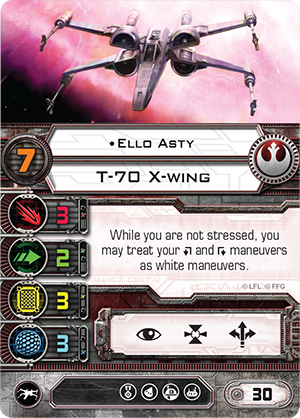 With their impressive stat lines, tech upgrade slots, and talented aces, the T-70 X-wing and TIE/fo fighter are rapidly helping to decide the fate of the galaxy, and they're an excellent way to celebrate the imminent arrival of The Force Awakens! A 360-degree view of the T-70 X-wing. You'll find one of these starfighters within the T-70 X-wing Expansion Pack, carefully detailed and pre-painted at the game's standard 1/270 scale, as well as four ship cards, five upgrades, a maneuver dial, and everything else that you need to fly your T-70 X-wing into battle against the First Order. 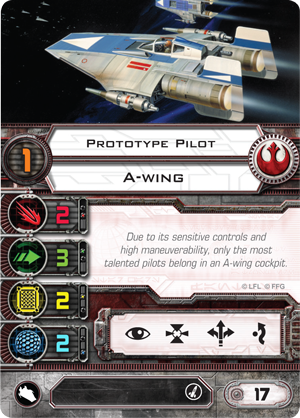 Notably, even as the expansion's upgrades provide a natural fit for the T-70 X-wing and pilots such as Ello Asty , they also provide a significant boost to the classic T-65 X-wing flown by such renowned Rebel Alliance pilots as Luke Skywalker and Wedge Antilles . 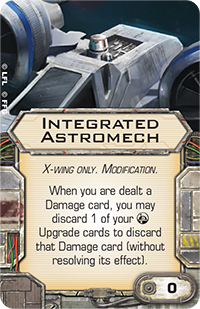 The biggest part of this boost comes from the new "X-wing only" modification, Integrated Astromech, which allows you to discard an astromech upgrade to discard any damage card you are dealt before you resolve its effects. 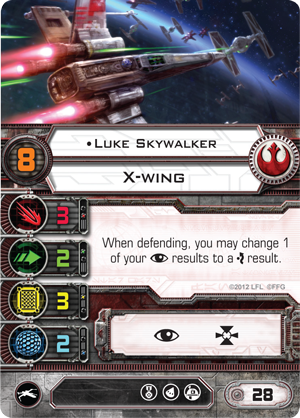 The card's timing is critical, here, because if your X-wing has been stripped of its shields, is down to its three hull, and suffers one hit and one critical hit, you can accept the facedown damage card and then reveal the faceup damage card you suffer from the critical hit. If it's a Direct Hit! that would count as two damage and explode your ship. 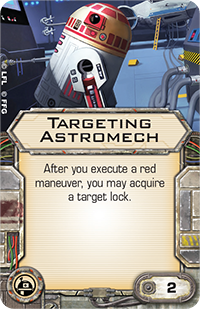 On the other hand, if you can live with the damage the card inflicts, then you can keep your astromech onboard to continue taking advantage of the benefits it grants you, knowing that it can still protect you from a later shot. 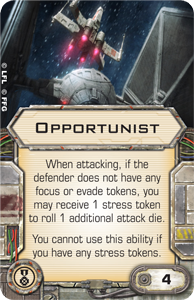 No X-wing pilot wants to discard an astromech droid as useful as BB-8 – or even the T-70 X-wing Expansion Pack's Targeting Astromech – but when the alternative is losing your whole ship (along with the astromech), the decision is pretty easy to make, especially given the fact that the Integrated Astromech modification costs you nothing against your allotment of squad-building points. A 360-degree view of the TIE/fo fighter. 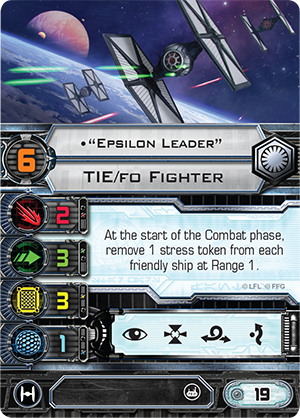 The centerpiece of the TIE/fo Fighter Expansion Pack, your miniature TIE/fo fighter arrives pre-painted with a black hull and with black-trimmed wings featuring white solar panels. 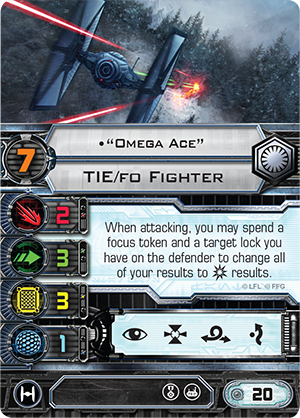 It is accompanied in the expansion by all the components you need to outfit it for battle, including a maneuver dial, two upgrades, and six ship cards that introduce no fewer than three unique First Order aces. 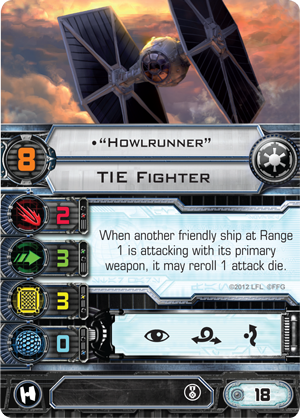 Perhaps more comparable within X-Wing to the Rebel Alliance's A-wing than the Galactic Empire's TIE fighter, the TIE/fo is a fast, agile, and maneuverable ship that can rely upon the extra resilience it gains from its shields to play any of a variety of roles within your squadron. 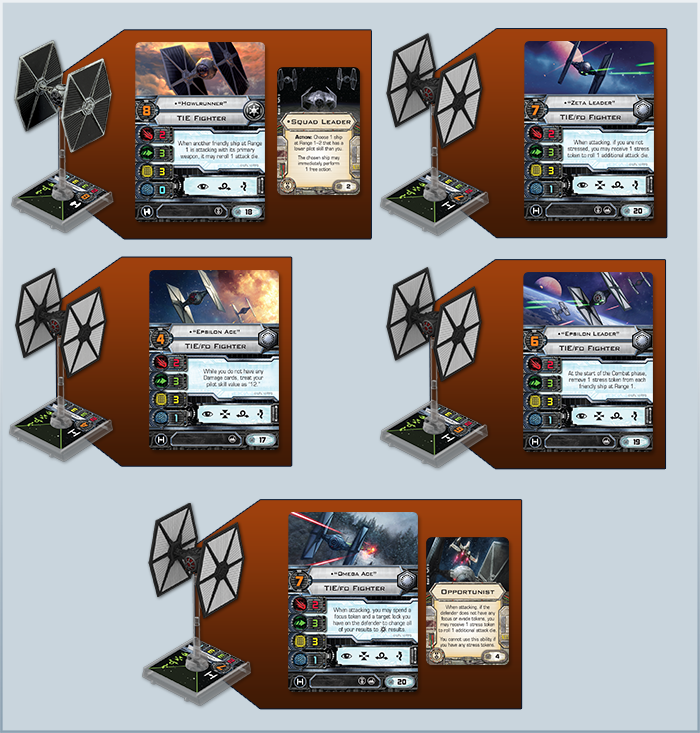 You can add the TIE/fo into a traditional TIE fighter swarm in order to toughen it up a little. 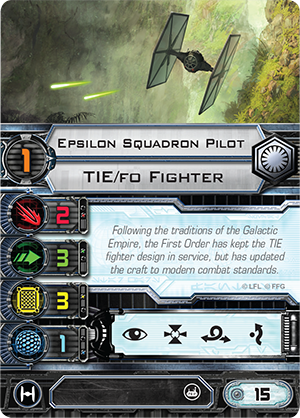 You can use a pilot skill value "1" Epsilon Squadron Pilot as an inexpensive blocker, much as the Rebels might use a Prototype Pilot to block your opponent's flight paths. 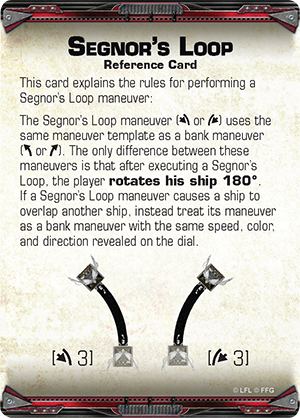 Utilized as a blocker, the TIE/fo benefits greatly from its enhanced maneuverability and the two Segnor's Loops that its dial has and the TIE fighter does not. 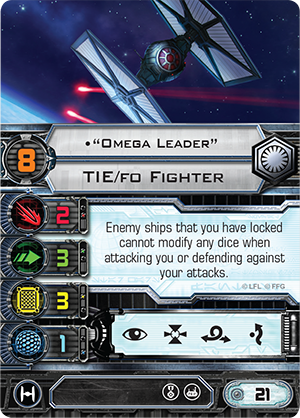 You can incorporate the TIE/fo ace "Omega Leader" into your squadron in order to counter enemy aces who rely heavily on modifying their dice results in order to offset their ships' vulnerabilities. 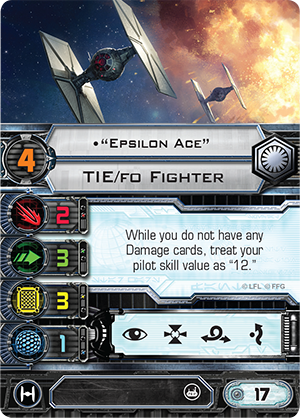 Finally, you can use high pilot skill aces like "Zeta Leader" and "Epsilon Ace" within TIE squadrons dedicated to striking early in the combat phase and for maximum impact. 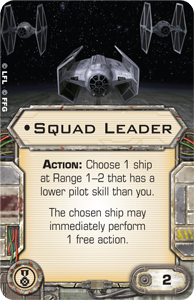 For example, you could fly these pilots in the same squadron as Squad Leader "Howlrunner," whose unique pilot ability allows you modify their attack dice. 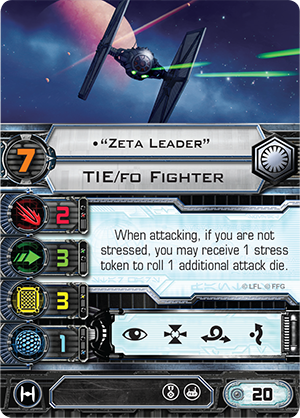 Together, these TIE/fo aces can attack early to strip focus and evade tokens away from their targets before "Omega Ace" can finish them off with potent, Opportunist attacks, and the inclusion of "Epsilon Leader" within the squadron ensures that both "Omega Ace" and "Zeta Leader" will be able to clear the stress they take in order to fuel their extra attack dice, allowing them to take actions and increase the potency of their attacks immediately in subsequent rounds. No matter how you fly it, you will find that the TIE/fo fighter is a surprisingly versatile starfighter and one well worth sending into battle against your opponent's Resistance forces. Tomorrow, Star Wars: The Force Awakens marks the beginning of a new chapter in the Star Wars universe. 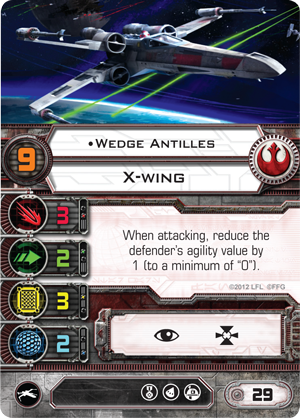 Today, the T-70 X-wing Expansion Pack and TIE/fo Fighter Expansion Pack carry us headlong into a new chapter of your X-Wing battles. With these expansions, you can bolster your Resistance and First Order fleets and explore new squad-building possibilities within each. Head to your local retailer today to pick up your copy of the T-70 X-wing Expansion Pack and the TIE/fo Fighter Expansion Pack. These X-Wing expansions are now available throughout the United States. Availability in other regions may vary.